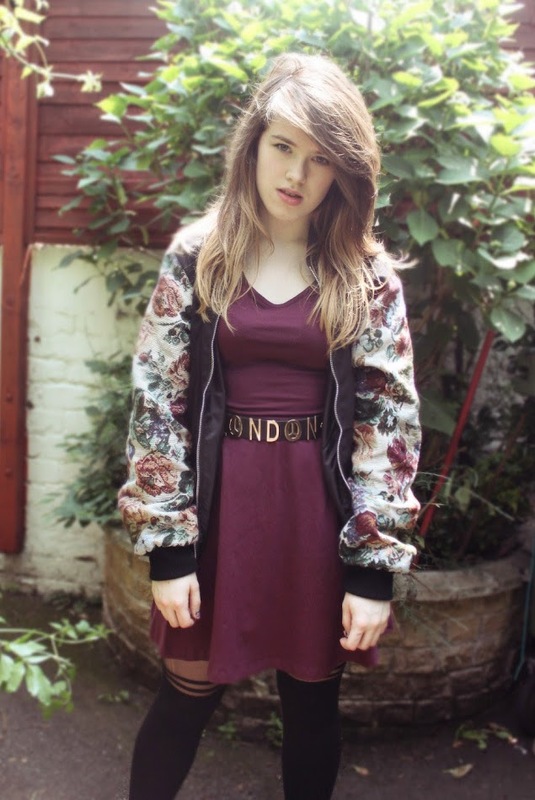 Vintage Varsity Jacket - ASOS (mens) | Burgundy dress & Tights - ASOS | London belt - Topshop. 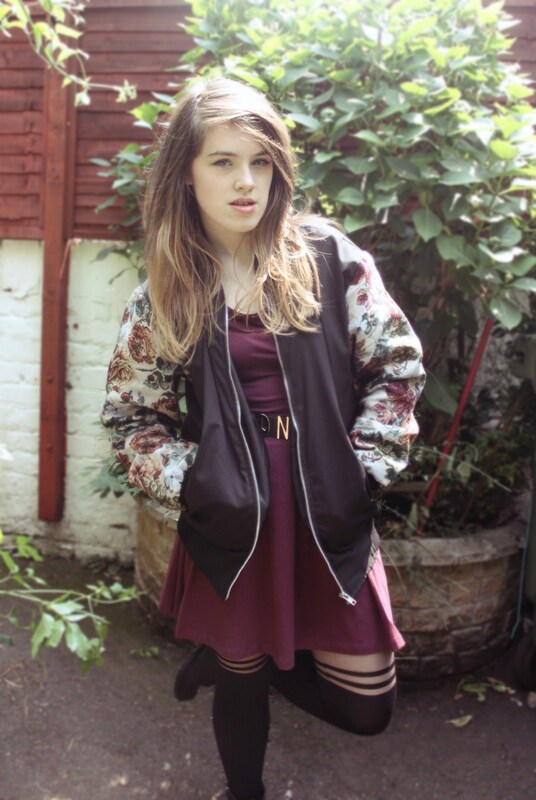 Anywhoo I just received this awesome varsity jacket from ASOS mens. I got it in XS which is still massive (cuz it was designed for men after all) but I prefer my jackets over sized so it's cool. It doesn't look as it was pictured on the website at all, which was confusing, but I think the thing about reclaimed vintage is that they source old recycled fabrics so nothing's ever strictly identical, which is kinda cool when you think about it. The thing I love best about this jacket has to be the tapestry print sleeves; they make me look like I've macho man arms though which I should hate but idk, doing years of figure skating's given me super toned legs and arms as limp as spaghetti, so this way I can at least look like I have muscle when in reality I can't even push a door open (yes, it's actually that bad). Anywayz I think this jacket's a great way to wear florals whilst avoiding the typical summer floral cliches, as it's a little grunge but still casual enough not to fit under any one style. My mum thinks it looks like something Oliver Proudlock from Made In Chelsea would wear. If you don't know who I mean check out his blog - I really wish I knew of more male style bloggers out there. If you are / know of any good ones leave me a link in the comments as that would be wunderbar. In other news, I'm performing at the fringe festival next month - which I'm super excited about, so I've been busy learning lines and stuff for that. I've also started writing music more, which is something I don't really talk about to people as I know I'm no good (and I'm not being modest here) but eh I still love it, even though I probably drive my family and anybody within a mile radius crazy, ew yeahh... 'til next time guys! OMG your style is FLAWLESS! I adore this look, that jacket is so cool! Honestly couldn't tell it was from the mens section! It looks pretty sweet! You've rocked this look, HARD. Good luck with the Fringe fest! Totally loving the jacket. The contrast between the print and the black makes it such a stand out.